Arc De Triomphe, one of the worlds largest triumph arc, is a great monument located in Paris which stands in the centre of “Charles De Gaulle”. 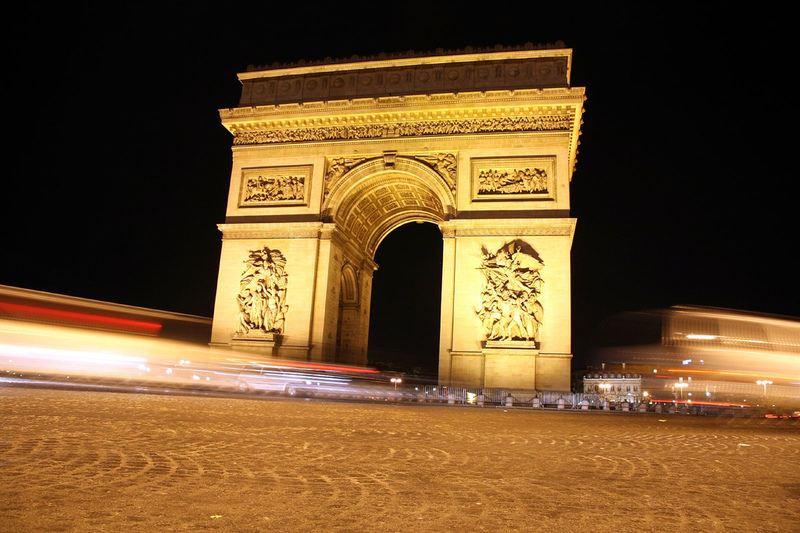 The arc was built as the honor for those who fought for France especially during the Napoleonic wars. There are names of the generals and the wars fought engraved inside and at the top of the arch. Underneath the arch there is tomb of a soldier of World War I who is still unknown. This great arch has a height of 50 meters, a width of 45 meters and a depth of 22 meters which makes it as a second largest triumph arc in the world. It is composed of three arcs, where two are small arcs and the other is a large arc. The large arc is 9 feet wide and 21 feet height. The design of the arc was inspired by the roman arch of Titus. This great arc is compared as linchpin of the historic axis. It was commissioned in the year 1806 after the victory at Austerlitz by Napoleon. Laying the foundation of the arc took about 2 years. When Napoleon entered into Paris with his bride in the year 1810, he had a wooden mock-up of the completed arch constructed. The architect, Jean Chalgrin, died in the year 1811 and the construction was halted. Then it was succeeded by Jean Nicholas Huyot. On this page is not the picture of the Arc de Triomphe in Paris but the Arc de Triomphe in Montpellier (you can see a woman who carries blue files. She certainly goes courthouse just to the right). The Arc de Triomphe in Montpellier has a lot of charm, but the Arc de Triomphe in Paris is so much bigger. One can see in the distance, the equestrian statue of Louis XIV. Montpellier is a beautiful town in France near (10 km) from the Mediterranean Sea. Tell me if you require further information or photos. It is not the Ark of Triumph (Arc de Triomphe de l’Etoile) in PARIS. You must change the picture. You had put the Ark of Triumph of the city of Montpellier in South East of France (Languedoc). Image updated! Thanks for the help.